Maimunah Aminuddin is a retired Professor from the Faculty of Business Management, University Teknologi MARA (UiTM) with vast experience in the areas of management and human resources. She is a fellow of the Malaysian Institute of Human Resource Management (MIHRM) with expertise in the areas of employment, labour and industrial relations laws. She has authored numerous publications in the aforesaid areas, such as the Essentials of Employment and Industrial Relations (2009) and Termination of Employment - Understanding the Process, which was revised in 2012 and is in its 2nd Edition. Her latest book, the Employment Law Manual for Practitioners, was published in October 2013. Queries and comments may be sent to the columnist at letters@mylawbox.com with the sender’s full name and e-mail address. 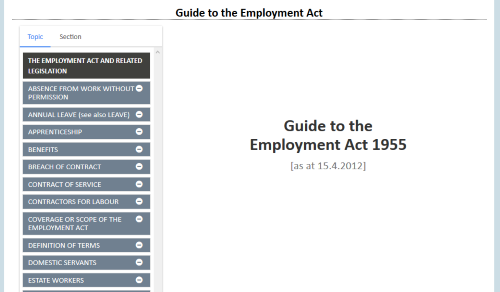 All employers who employ people to work in Peninsular Malaysia must comply with the Employment Act 1955. This key piece of labour legislation applies mostly to workers earning not more than RM2,000 per month, but also, since the 2012 amendments, includes sections which apply to all employees. The topics in the Guide are offered in alphabetical order and are written in a manner that they can be understood by readers without legal training. Each topic is divided into sub-headings in the form of questions. All sections of the Act are included but with particular emphasis on Absence from Work, Annual Leave, Coverage of Scope of the Act, Foreign Employees, the Labour Court, Maternity Leave, Sexual Harassment and Wages. The relevant section in the Act is listed and examples of court judgements are provided. 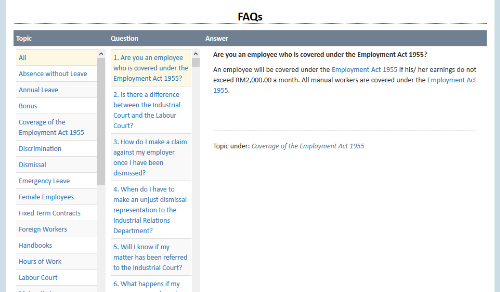 The Guide also provides a brief overview of the Labour Ordinances of Sabah and Sarawak and the Employment (Part-time Employees) Regulations 2010. 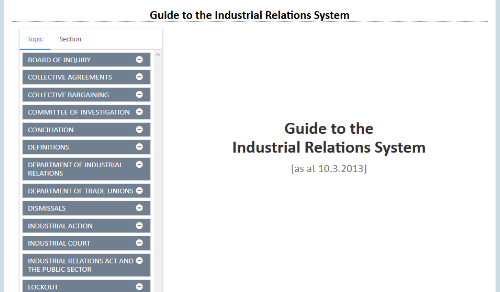 The Industrial Relations Act 1967 and the Trade Unions Act 1959, together create the boundaries for the industrial relations system. Employers, employees and trade unions throughout Malaysia are required to comply with these two Acts. The Guide provides topics in alphabetical order which explain and illustrate by case examples the requirements of the two Acts. All sections of the Acts are included, with emphasis on Collective Bargaining, Collective Agreements, Functions of the Department of Industrial Relations, Functions of the Department of Trade Unions, Penalties, Pickets, Recognition of a Trade Union, Role of the Minister of Human Resources, Strikes, Trade Disputes and Trade Unions. 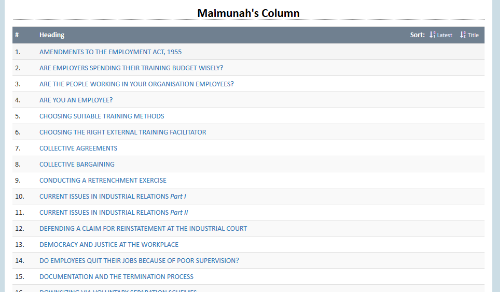 Each topic is divided into sub-topics for easy reading. Practical HR Management provides insight into topics such as hiring, firing, privacy, discrimination, sexual harassment and more. It features real scenarios and insightful commentary from leading industry experts and employment law practitioners. Discover techniques you can use to engage your employees in your workforce to drive results for both your organization and your employees. Find answers to your employee problems from practitioners who face the same labour and HR challenges you have every day. One of the UK’s largest energy providers has been ordered to pay an employee £230,000 for unfair dismissal after an HR process a judge said was "reminiscent of a show trial in the former Soviet Union". Scottish and Southern Energy (SSE) said Donald Nutt, who had worked at the firm for 16 years before his dismissal in October 2014, was laid off because of “a breakdown in trust and confidence” between him and his employer. THE latest Malaysia Salary Guide for 2019 unveiled by Kelly Services, has shined a spotlight on the growing need for digital skills among workers as Malaysia is swept by the digitalisation wave. The report shows that demand for digital talent is fast growing despite a comparative shortfall of supply, a sign that Malaysia is facing challenges in building its digital workforce. The report, which dives into a wide range of employment sectors, points out that the banking and shared services sectors have been seeing slower growth since the last Malaysian elections. On the other hand, the engineering and information technology sectors are expected to grow in 2019.